On March 29th after both Chicago Blackhawks goalies fell to injury during a game against the Winnipeg Jet, former Western Michigan goaltender and HeadStrong Grafx client Scott Foster was thrust into the spotlight to hold onto the Blackhawks lead with 14 minutes left in the 3rd period. Making 7 saves and allowing no goals, Foster saved the victory and earned first star honors for his performance. 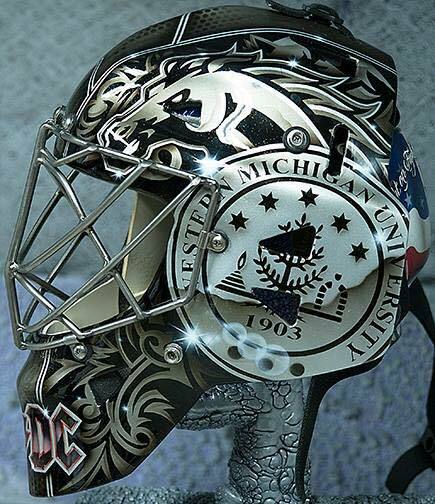 Scott still uses his AC/DC themed mask that Jason painted years ago during his time at Western Michigan! Check out the highlight video from Scott's night below and see some detailed images of the mask! Check out the first installment of the HeadStrong Grafx Testimonial Series featuring Grand Rapids Griffins goaltender Cal Heeter. Take a behind the scenes look at the process in creating Cal's design and why it's one of his favorite masks to date!